De Tomaso is an Italian car-manufacturing company. It was founded by the Argentinian-born Alejandro de Tomaso (1928–2003) in Modena in 1959. Originally, De Tomaso produced various prototypes and racing cars, including a Formula 1 car for Frank Williams's team in 1970. De Tomaso's first road-going production model was the Vallelunga, introduced in 1963. This striking mid-engined sports car was propelled with a 104 bhp (78 kW) Ford Cortina engine, and had a top speed of 215 km/h (134 mph). 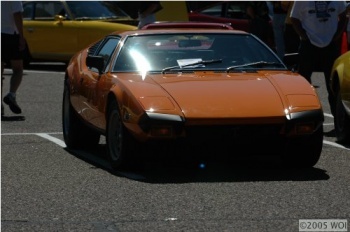 It featured an aluminium backbone chassis, which was to become De Tomaso's technological trademark, and fibreglass bodywork. The first De Tomaso produced in anything like significant numbers, the Mangusta, introduced in 1966, was also the first to be developed in association with Ford, a firm which was to have a decisive influence on De Tomaso's early life. With the Mangusta De Tomaso moved from European to American Ford engines; powered by a 4.7-litre iron-block V8 engine and with steel and aluminium coupé bodywork from Ghia – an Italian coachbuilder also controlled by Alejandro de Tomaso – the Mangusta could more than compete with contemporary Ferraris and Lamborghinis on looks, if not on cachet. With its flowing panels and almost absurdly raked rear window, the Mangusta was a true Italian supercar. About 400 examples were built until production ended in 1971. After its brief flowering as a mass-production car, the Pantera settled down during the 1970s and into the 1980s as an ordinary, small-production but 'invisible' Italian supercar. This was a shame, as it combined the Mangusta's sound mechanicals and (almost as) striking looks with a larger engine and a more luxurious interior. Price-wise, it was much more affordable than its rivals from Ferrari, Lamborghini, Aston Martin and Iso. 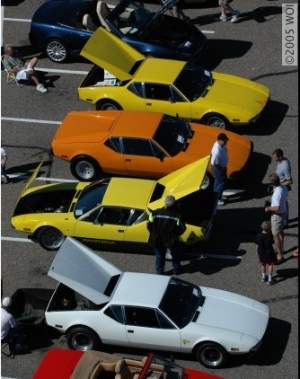 Pantera production continued at a greatly reduced scale, at a rate of less than 100 cars per year. From this point forward, the cars were being largely hand-built. In 1980, the GT5 model was introduced. The GT5 incorporated better brakes, a more luxurious interior, much larger wheels and tires, and a fiberglass body kit comprised of an air dam, wheel flares and running boards. Production of the wide body GT5 and similarly equipped narrow body GTS models continued concurrently until 1985, when the GT5-S replaced the GT5. Although the factory has not made its records available, it is thought that less than 252 GT5 Panteras were built. The GT5-S featured single piece flared steel fenders instead of the GT5's riveted-on fiberglass flares, and a smaller steel front air dam. The 'S' in the GT5-S name stood for "steel". Otherwise the GT5-S was largely identical to the GT5. Again, although there has been no confirmation from the factory, it is thought that less than 183 GT5-S Panteras were built. Concurrent GTS production continued, on a custom order and very intermittent basis, until the late 1980s. Incorporating a Marcello Gandini facelift, suspension redesign, partial chassis redesign and a new engine, the Pantera 90 Si model was introduced in 1990. Only 38 90 Si models were sold before the Pantera was finally phased out in 1993 to make way for the radical, carbon-fibre-bodied Guarà. The Guarà is De Tomaso’s most recent production car, and has been built in fits and starts since 1993. Available in coupé and barchetta versions and based on a Maserati competition car from 1991, the Guarà uses Ford and BMW parts in a sweeping composite body which betrays its origins on the track (the Maserati prototype didn’t even have a windscreen). As with all De Tomasos except the Pantera, production has been both small and sporadic. In the early 2000s two other cars were planned by De Tomaso, but both proved abortive. A two-seat Gandini-styled convertible, the Biguà, was developed from a 1996 Geneva concept in partnership with Qvale, an American firm which had long imported European sports cars into the USA. But as soon as the Biguà – by now renamed the Mangusta – started coming off the assembly lines the relationship between De Tomaso and Qvale soured; Qvale took over the car completely and it was rebadged as the Qvale Mangusta. Despite taking the name of an illustrious De Tomaso of old, production was short-lived, and Qvale’s Italian factory was bought in 2003 by MG Rover and the Biguà/Mangusta mechanicals used as the basis of the (equally short-lived) MG XPower SV. Subsequently, De Tomaso embarked on a project to build off-road vehicles in a new factory in Calabria in partnership with the Russian company UAZ, but this too foundered. The deal was signed in April 2002, with a plan to build 10,000 cars a year by 2006: however, no cars materialised and De Tomaso went into voluntary liquidation in June 2004. The Guarà remained available in some markets in 2005 and 2006, but it appears that there were no cars built after 2004. Although car enthusiasts know De Tomaso principally as a maker of high-performance sports cars, the firm also produced luxury coupés and saloons – albeit in tiny numbers – throughout the 1970s and '80s. The 1971 Deauville was De Tomaso's attempt at a rival to contemporary Jaguar and Mercedes-Benz saloons. With the same engine as the Pantera but mounted in the front, the Deauville was clothed in an angular but elegant Tjaarda/Ghia four-door body which had more than a hint of the Jaguar XJ6 about it, and came with the leather-and-air-con trim level that might be expected in such a car. The Deauville did not have a hope of competing with its rivals, especially those from Germany, on the quality of its build, but it blew them out of the water on rarity-appeal – despite remaining on De Tomaso's books until 1985, only about 300 were ever made. The ultimate rare Deauville is the single example of an estate, built for Alejandro de Tomaso's wife, the American racing driver Isabelle Haskell. 1972 saw the introduction of a coupé based on the Deauville, the Longchamp. Mechanically this was essentially the same car – the Longchamp used a slightly shortened Deauville chassis and had the same Ford V8 engine. The squarer, flatter body, however, was substantially different, without the Deauville's flowing lines. In 1976, Alejandro de Tomaso, with the assistance of the Italian government, took over Maserati after its owner Citroën (itself recently taken over by Peugeot) declared that it would no longer support the loss-making company. The first 'new' Maserati that the De Tomaso regime introduced, the Kyalami, was in fact a mildly reskinned Longchamp with the Ford engine replaced by Maserati's own 4.2-litre V8. The two cars, outwardly similar except for their badges, grilles and headlights, remained in production until 1983, when the Kyalami was superseded by the genuinely new Maserati Biturbo, introduced two years earlier. The Longchamp trickled on until 1989. Just 395 Longchamp coupés and 14 convertibles were built.